After writing the initial blog I could hardly wait to get started. Took care of few things around the house, re-read the first chapter a few times, checked my lumber supply, kissed the baby and retreated to my shop for the day. The book opens with some initial information about types of saws and tools a woodworker needs, an overview of the fundamental joinery and some other basic terminology. Great information, but all stuff that I was already pretty familiar with. A little context…our home came with a perfectly good medicine cabinet when we moved in, but to be honest, practicality was never part of the equation. 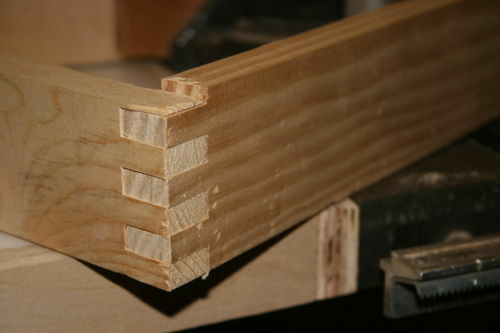 Woodworkers don’t build furniture because they need it anyway…right? And, when I started thinking about this project I decided that whatever doesn’t find a place in our home will more than likely be donated to Habitat for Humanity or a similar organization for another family to enjoy. The project calls for oak, pine, or any other hardwood of your choice. I happened to have a stack of 4/4 oak that a friend gave me that would work perfect. Following Norm’s instructions I began by cutting my components for the case to size. first step, ripping it to the appropriate width. 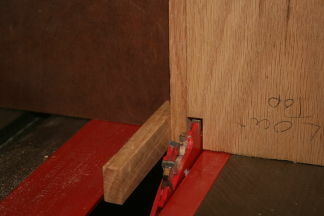 After the pieces had been ripped and cut to length it was time to build the first jig for the project – The Finger Joint Jig. In full disclosure, I’ve been looking for an excuse and instructions on building one of these jigs for a while. I’d put it off for various reasons. Short attention span… Lack of materials… Fear of complexity… so this was a great opportunity to finally do it. I won’t go into too many details on the process for building the jig – you can find them all over Lumberjocks with a quick search. StumpyNubs can also hook you up with plans for one of the coolest box joint jigs I’ve ever seen. 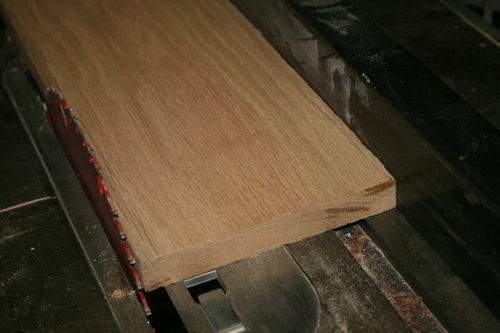 The jig Norm recommended is pretty simple – 3/4” backer board, two 3/8” cuts with a dado blade and some 3/8” keys to help space everything out consistently. This was one of the spots where I had to hit the pause button. The jig called for a 3/8” wide by 3/4” high cut using the table saw and a dado blade. 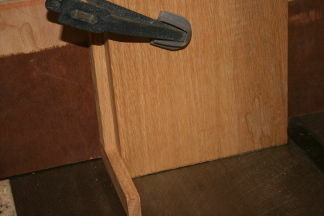 When I bought my old craftsmen tablesaw at a garage sale it came with a brand new wobble dado blade – never used. After fiddling with the contraption for a little while – and some quick reading on the internet and LJ forums I decided a replacement was in order. 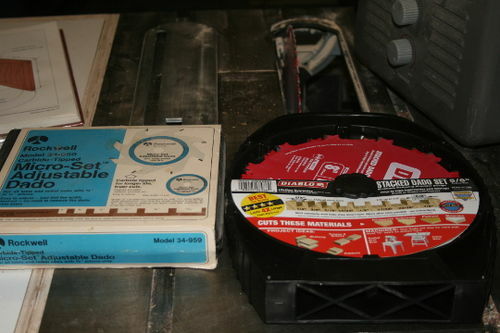 From what I gathered, the wobble dado blades work…but they’re hard on the table saw arbor, and to be honest the thing kind of scared me. A quick (relatively) trip to Midwest Woodworkers and I was back in business. This is where the lessons from the book started paying off. I tend to have a ‘give er hell’ attitude when I build things like jigs or set-up cuts. Sometimes it works out – most times I end up having to re-cut pieces and add to my “cutting board pieces” box. Norm recommended running some test cuts on some scrap stock to get the spacing on the fingers dialed in. Too much or too little space between the blade and the pin and your fingers don’t fit. I cut my test pieces and beamed with pride at their beauty and perfection…until I tried to fit them together. Hand pressure didn’t do the trick…out came the mallet…and I beat the poor thing into submission. After some fiddling with the jig and cutting my slots and key the second set came together MUCH better. 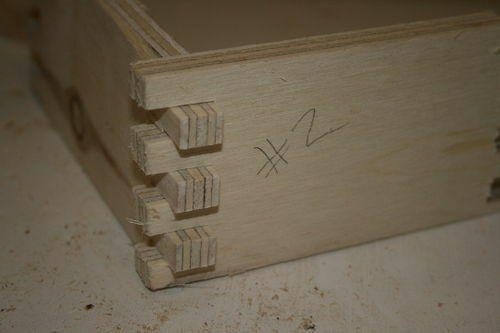 With the finger joint jig dialed in, I was ready to take the plunge and start cutting the finger joints into my case pieces. This part was fairly quick and uneventful….line up the first piece with a spacer, cut, move over to the key, stack it’s mate on top, cut, move to key, repeat. Although this was pretty routine and quick, it did offer up a “duh” moment. A smear of paste wax on the key made moving the fingers on and off MUCH easier. To be honest, it turned out better than I had anticipated. I was VERY happy with the results and the jig. I took it apart, attached all the pieces and hung the jig on the wall for future box making adventures. 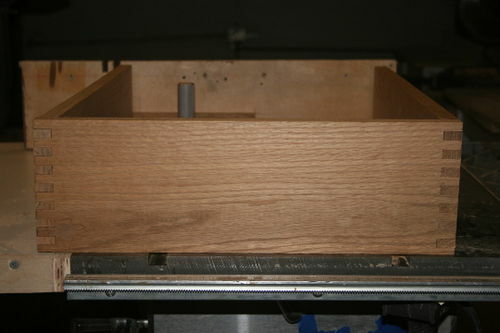 In the next blog I’ll show you the next steps I took, drilling the shelf pins, cleaning up the pieces, assembling the case and milling the pieces for the face frame and door. Thanks Brian, I appreciate the positive feedback! 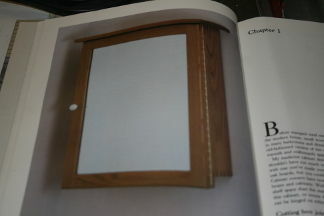 Took a look at your projects, that jewelry box (link) you built is dynamite! 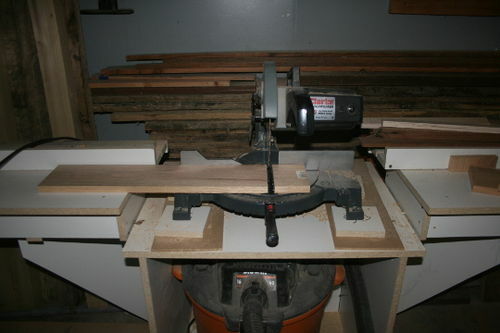 I’m in the same boat about the spindle sander – I would love to own one for sanding complex curves but haven’t been able to convince myself to bite the bullet and pick one up. Did you ever take the plunge? Wow, so, I think this book looks really not basic. As a total beginner I would be very put off by this project – it looks amazing! And amazingly difficult and complicated. Ejvc – Thanks! At first glance it can definitely look intimidating, but the projects are presented in a really accessible way. I think the difficulty of the project may also be dramatized by my blog – It’s definitely hard to work and accurately capture the steps. I took a look at your blog and think it’s awesome that you and your daughter are working on projects together! I added your blog tool box to my “to do” list for when my daughter gets a little older.